Until recently, the earliest existing sound recording was thought to be a Handel oratorio recorded at the Crystal Palace in 1888. But a group of dedicated researchers at First Sounds have managed to prove that idea wrong. They decoded ten seconds of the song "Au Clair de la Lune" that was recorded using a phonautograph on April 9, 1860. 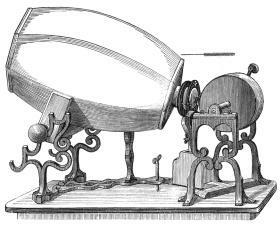 The phonautograph was invented by Édouard-Léon Scott de Martinville in 1857. It used a horn as a microphone to move a bristle which scratched a pattern on a soot-covered glass plate or paper. Scott never intended the phonautograph to be used to record sound, but as a way to study acoustics. That was probably a good thing when you consider that the technology needed to play back a phonautograph recording would not exist for almost 150 years. You can hear the samples that they have decoded at the First Sounds Sounds page. I find it amusing that the phonautograph recorded sounds visually (like a CD or DVD) rather than mechanically (like a phonograph record). It seems that technology has come full circle.